Fortunately, some east end residents are now asking their councillors to build a protected cycle track along Danforth from Broadview to Woodbine. It’s a project all Torontonians should get behind. New bike lanes would be part of a makeover that transforms Danforth into a “complete street,” one that also features wider sidewalks, street art and plenty of trees and flowers. The east end’s grand thoroughfare would become a stronger magnet for shoppers, diners and bar-hoppers. It would be safer for all road users and an even better place to do business. We know bike lanes are associated with a strong business climate because we’ve seen what happens in other cities. In New York, retailers along Ninth Avenue experienced an increase in sales of up to 49% after buffered bike lanes were installed. 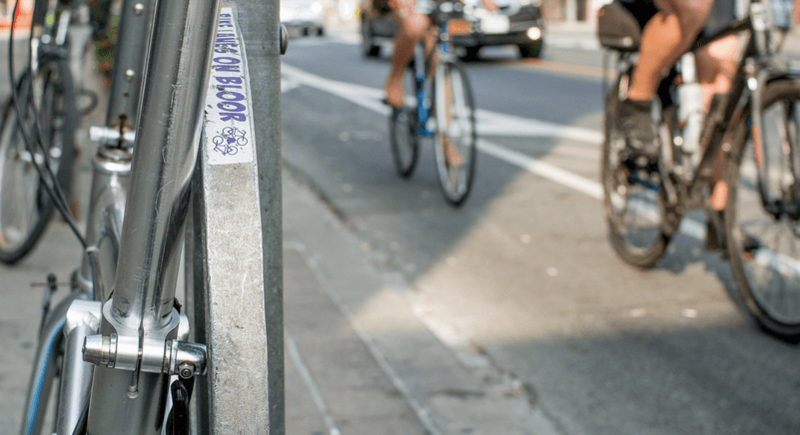 The University of Toronto’s Cycling Think and Do Tank suggests that, over the course of a month, a cyclist frequently spends more money than a motorist does. Another thing we know is that riding a bike is excellent exercise. A 2017 study in the British Medical Journal compared the health of people who commute to work by bike to those who drive or take transit. The results were striking. The study’s authors found, “Cycle commuters had a 52% lower risk of dying from heart disease and a 40% lower risk of dying from cancer.” Other studies have shown similar benefits. Very few medications can match that for effectiveness! To encourage people to ride bikes we have to make them feel safe. The best way to do that is to allow people to ride their bikes separated from cars and trucks. Research done in Toronto shows that people riding in bike lanes separated from traffic are much safer than people riding in traffic, with the risk of injury going down by 90%. Anyone who has used the cycle tracks on Richmond or Adelaide streets can feel the increase in safety immediately. It’s why they have become so incredibly popular. Bike lanes on Danforth could bring similar protection — even save lives — in the east end. Recent polling from Ekos found 88% of Toronto residents are concerned about road safety and 82% support building protected bike lanes. Among drivers, endorsement of the lanes is at 75%. Politicians who voted for Danforth lanes would simply be following their constituents’ wishes. Danforth is ideal for cyclists because it’s flat and lacks streetcar tracks. It’s also wide, meaning it could accommodate bike lanes while still making room for automobiles. Parking wouldn’t be a problem because there are plenty of Green P lots in the area — eight from Broadview to Pape alone. Besides, only a small proportion of visitors travel to the Danforth by car — just 19%, according to a 2014 study from the Centre for Active Transport. This is a community that has space for the full range of mobility options. Business students suggest the future’s most vibrant neighbourhoods will rely heavily on active transportation. They’ll be great places to walk, roll and ride a bike. If this is true, cycle tracks are not a frill but essential. The Danforth needs to embrace them or risk being left behind as other areas, like the Annex, build this infrastructure. The east end’s prosperity — as well as its residents’ safety — may depend on it.